Mangere Mountain is one of the largest volcanic cones in the Auckland Volcanic Field. With a peak of 106 metres above sea level, the mountain was a site of a major Pa settlement. Pa basically means fortified settlements. 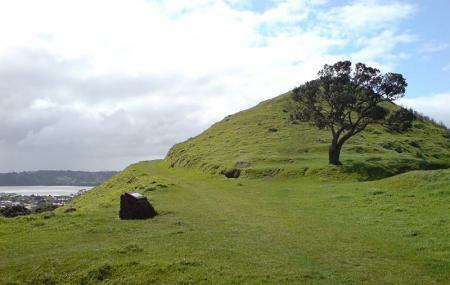 One can still see perfectly intact Pa features at Mangere Mountain along with lava domes, lava flows and lava caves. How popular is Mangere Mountain? People normally club together Auckland Zoo and One Tree Hill while planning their visit to Mangere Mountain. Quiet location, lots of interesting facts about the history of area. Great way to see lovely views of Auckland. Great place to take the family for a walk, wonderful people at the history centre, offered my mother who could make the walk a tea and food while she waited for us to return. Fantastic views and it can be an easy treat or a hard one, depending on the way you take. Met some friendly locals alone the way. Easy climb lots to see and explore. Neat Maori history to vibe out. Great fun with my 5 years went up the summit.